Southern Pine Restorations was born from a love of painting and furniture restoration. Giving new life to old, worn wood is our passion. Whether making a thrift store find look new again or making an outdated piece current, we can take any forgotten furniture and restore it so that it fits seamlessly into your home. We believe good furniture is the backbone of a room and is the foundation upon which you build your life. Dining tables are for gathering, couches are for cuddling and entry tables are for sharing memories and mementos. We would love to be part of your story. Rebecca is a Georgia native, growing up in Woodstock, GA. She attended Florida State University and received a Bachelor of Science in Fashion Merchandising. Rebecca spent the beginning of her career in Retail Management and Public Relations and eventually found her home in Dental Administration, managing a local pediatric dental practice. She began refinishing furniture for her own home, and what started as a hobby quickly grew into a passion for building and restoring furniture and accessories. 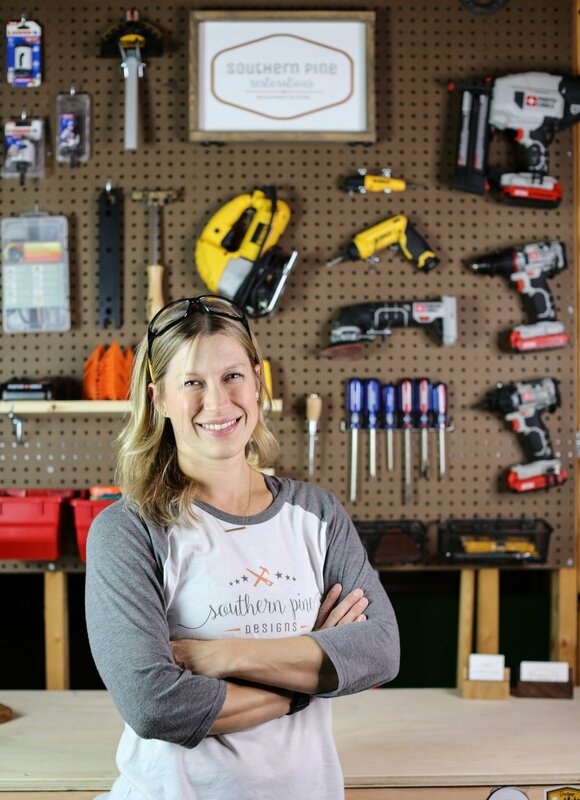 Rebecca fell in love with woodworking and began Southern Pine Restorations in 2016. In 2018, after identifying a desire to inspire other women to woodwork and DIY, she began blogging as Southern Pine Designs. Rebecca continues to grow her businesses as she grows as a woodworker, adding new skills to her portfolio every day. Her long term goals include providing both beginner and intermediate building plans as well as video content creation. In her time off work, Rebecca enjoys paddle boarding and spending time outdoors with her husband and their son, and they are excited to welcome a new baby girl in Fall 2019.